The Change of Heart Cardiac Rehabilitation Program at St. Mary's Regional Medical Center offers a patient-centered program that emphasizes a personalized approach to recovery through exercise, education and encouragement. Our team of healthcare professionals includes cardiologists, registered nurses, exercise specialists and dietitians. Exercise: We develop a personalized exercise program designed to improve the efficiency and stamina of the heart, as well as overall physical health. These exercise classes are closely monitored by staff and held throughout the day. Education: We share a wide range of information (literature, support groups, classes) with both patients and families to help patients make needed lifestyle changes. 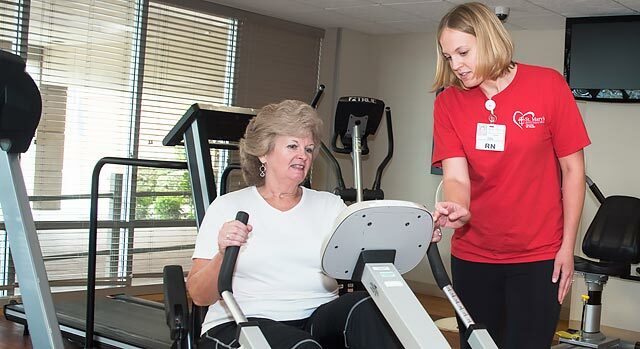 Encouragement: Our cardiac rehab professionals play a major role in helping patients reduce anxiety about where they are in their recovery, and help them gain or renew self-confidence in their abilities. An ongoing program is available to cardiac rehab "graduates" to support their continuing heart health. Graduates can continue to attend supervised exercise programs. After undergoing heart bypass surgery, Debbie Bell began cardiac rehabilitation at St. Mary's Cardiac Rehabilitation Program. The St. Mary's Cardiac Rehab Program is available to adults diagnosed with coronary heart disease. A physician referral is required and the referring physician is provided with progress reports on a regular basis. Most insurance companies cover all or part of the program costs. Coverage may vary with individual policies, however, and should be confirmed prior to entering the program. Members of the cardiac rehab staff can provide assistance with confirming insurance coverage, if needed. Your insurance may cover the ongoing rehabilitation program that is available to all of those who graduate from the cardiac rehab program. To learn more about the St. Mary's Cardiac Rehabilitation Program, call 580-233-6100 and ask for the Cardiac Rehabilitation Program receptionist. If you need a referral to a cardiac specialist who is affiliated St. Mary's Regional Medical Center, call our free physician referral service at 580-249-3741.